Buffalo, New York:: Sun Young Kang,, 2018.. Edition of 20 + 1 AP.. Size: 85" x 5" x 3" open; 3" x 5" x 0.5" closed. Accordion structure. Two layers of paper: one of text and one as protection of the back side of the sewn text. Embroidery using artist's own hair on handmade Japanese paper. Materials: hair, Japanese paper, museum board, transfer print. Text in Korean with English translation on the colophon. Signed and numbered on the colophon by the artist. 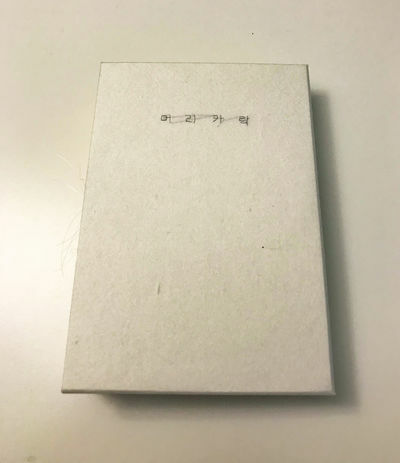 Sun Young Kang, colophon: "I feel estranged by myself being disgusted by my own hairs on the floor. Once, they were precious as part of me. But once they are shed, I alienate them and even hate them. So, I decide to collect my hairs that I lose as my way of embracing both of the feelings toward myself- the obsession and contempt."